Since Connor's second week he's been able to flip from his stomach to his back. Rolling over is something most babies don't do for quite a while. It's a lot harder to go from back to stomach, and Connor can't do that, but he's still a pretty tough guy. 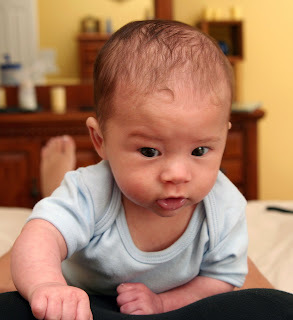 This morning he started getting good at lifting his head up when he's on his stomach. In our "What to expect the first year" book, it says that baby might be able to lift his head to 45 degrees by this point. Connor's been able to do that for a while, and he's now able to get it up to a full 90 degrees. He's still a little wobbly, but he's definitely tough enough for the task. I think this angle of him makes his head look a little funny, but I thought it was a cute shot. Wow! What a great looking kid.